Two of Bermuda's most sought after worship leaders have combined to form LAST CALL. Good music is something that should inspire its listener and cause great influence. Tricray and Adrian of Last Call seek to do just that. The pair of best friends who hail from Bermuda formed this duo upon the foundation of unity. They base their ministry off of Deuteronomy 32:30 – “How could one man chase a thousand or two put ten thousand to flight, unless their Rock had sold them, unless the Lord had given them up?” The name Last Call speaks of the pairs calling to be a voice in the Last Days. Last Call has been recognized as one of the leading Christian artists in Bermuda. 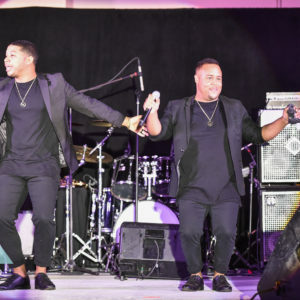 In under two years they have performed many concerts including opening for renowned gospel artist Tasha Cobbs, Anthony Brown, and Dietrick Haddon. Their ministry has allowed them to perform in many cities in the U.S. and last year they where featured artist at a conference in Kenya. The two worship leaders released their debut album entitled 10,000 on May 10th 2016. The project ushers its audience directly in to the presence of God. The styles on the album will range from CCM, gospel, Soul and everything in between. There is something for everyone. Both Adrian and Tricray believe their mandate is to take the gospel of Jesus around the world and to lead people into authentic praise and sincere worship.